Don’t miss out on MNA’s annual Volunteer and Donor Recognition Dinner on Oct. 17 at the Kellogg Hotel and Conference Center. Guests will enjoy a delicious meal, jazz music and the presentation of awards to hard-working, dedicated individuals who do so much to protect Michigan’s natural heritage. Tickets are $30. You can purchase tickets online through the MNA website or by contacting Danielle Cooke at dcooke@michigannature.org or 866-223-2231. A festive group at a past Volunteer and Donor Recognition Dinner. 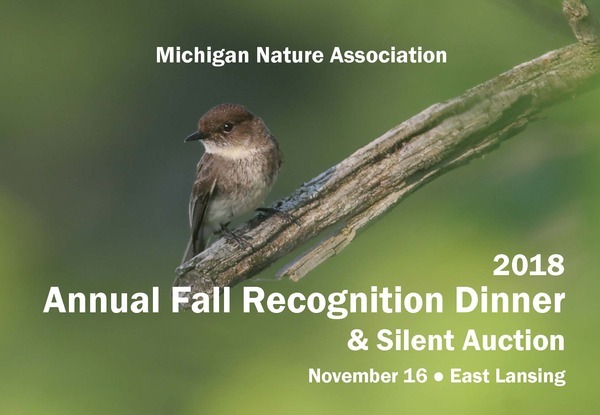 Join the Michigan Nature Association for a night of good food and great fellowship as we honor those who have given their time and effort through the years to help conserve the natural beauty of Michigan. MNA is holding the 2013 Volunteer & Donor Recognition Dinner on October 18 at 6:30 p.m. at the Kellogg Hotel & Conference Center in East Lansing. MNA will present several awards, including the Volunteer of the Year Award and the Mason and Melvin Schafer Distinguished Service Award at the event. The Volunteer of the Year Award is given to volunteers who devote many hours to MNA by attending workdays, completing file analysis, monitoring sanctuaries and volunteering in less than ideal weather conditions. This year’s Volunteer of the Year Award recipients are Bill McEachern, Barbara Mead, Mike Roys and Peter and Jill Pietila. The Mason and Melvin Schafer Distinguished Service Award is given to exemplary volunteers who have contributed to MNA over a minimum of 10 years. This year, the award is being given to Charles Eshbach for his service and dedication to preserving nature sanctuaries over the past 40 years. Along with honoring these extraordinary volunteers, the event will also feature a silent auction that will benefit MNA’s conservation actions. Guests will have the opportunity to bid on big-ticket items, such as a sea kayak tour for two people and a weeklong stay at a cottage up north. Everyone is welcome to attend the dinner. Tickets are $30, and can be purchased by calling (866) 223-2231, or emailing dcooke@michigannature.org. The deadline to RSVP is October 11. Reserve your seat today to be part of this special event! On Friday, October 26, nearly 100 MNA supporters gathered at the Kellogg Hotel & Conference Center in East Lansing for the 2012 Volunteer and Donor Recognition Dinner. The atmosphere was festive as Trustees, staff, donors and volunteers shared stories and memories. Volunteering is a family affair for Christopher Keller. His great-uncle, Charlie Goodrich, was a 2010 recipient of MNA’s Volunteer of the Year Award. Youthful Chris and experienced Charlie made a good team as they pulled garlic mustard from the woods of Hamilton Township Coastal Plain Marsh, built and maintained a trail system at Barvicks Sand Dunes, and tended to the reforestation of old fields at Dowagiac Woods. Despite his youth, Chris has learned well the lesson that volunteer service is the lifeblood of a successful community. Over the past two years, Paul has participated in many volunteer days across the state, most notably spearheading a bridge project at Kernan Memorial Nature Sanctuary. In addition to his work as a steward at Lost Lake Nature Sanctuary and Frinks Pond Plant Preserve, Paul has done a large amount of work for Wilcox-Warnes Nature Sanctuary, visiting frequently to clear the trail, pick up trash and interact with visitors. As an emissary, he also leads hikes and distributes MNA information in the local community. Mary serves as the steward for five eastern Upper Peninsula sanctuaries, including MNA’s largest property – the 837-acre Schafer Family Nature Sanctuary at Roach Point. Mary has painstakingly marked each sanctuary’s boundaries accurately, and drives all the way up from her home in Flint to participate in every field trip and volunteer day at each property. Her hard work has been a huge asset to MNA. Working alongside 2009 Volunteer of the Year Ruth Vail, Carolyn has been an essential member of MNA’s file review team. Over the past few years, Carolyn has helped with some of MNA’s stickiest legal files, tracking down information to make the review process much more complete. Carolyn’s dedication is key to keeping MNA on track to apply for accreditation in 2013. Cliff serves as the steward at MNA’s Prairie Ronde Savanna and Sauk Indian Trail Plant Preserves, both in St. Joseph County. He organizes and leads numerous volunteer days at each sanctuary and has conducted controlled burns on his own for several years. Cliff’s work at these sanctuaries has been invaluable.